Greenworks 2501302. 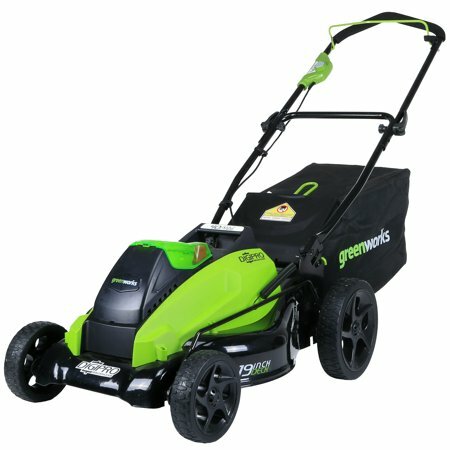 Features: 3-in-1 mowing capabilities - mulching, rear collection and side discharge. Powerful 40V motor provides tough cutting and mulching power. 19 in. wide cutting path offers a great balance of maneuverability and cutting capacity making it ideal for mid-sized areas. Rugged stamped steel cutting deck provides added durability. Adjustable cutting height with 6 different height settings. Cam-lock handle for easy folding and storage of unit. 40V G-Max Lithium-Ion batteries provide enhanced power for consistent performance. Please Note: 40V G-Max and 40V Lithium-Ion Batteries are not cross compatible; this tool is compatible with the G-Max 2.0 Ah battery (29462) and the G-Max 4.0 Ah battery (29472) (Sold Separately). proposition 65 reasons:Cancer and Reproductive Harm – www.P65Warnings.ca.gov. Though still new to us, having only mowed twice, we are liking what we see. Extra power kicks in when needed and then backs off by itself. Quiet operating and battery charge allows the use we need, mostly trim work, ditches and bagging areas of thicker grass that piles up after riding mower throws clippings. Then enough battery life to then use our battery powered trimmer on one charge. I love this mower since I can start it myself! I don't have to worry about dealing with gas or oil. It's easy to use on small lawn. It takes a little longer to do as it's a 19 inch but that's okay. I can mow the front lawn and get a start on the back lawn before it dies, about 50 min.Since we already had two GMax batteries for our GreenWorks chainsaw which I also run. We bought right from the company, which I also run, we didn't have to buy the mower with one. And we always have one on the charger so we can keep going. Now I plan on getting a hedge trimmer and maybe a weed wacker. Love the product. Love the company! The package arrived. I carried it to the back yard, opened it up, pulled it out, and the most difficult part was removing the plastic sleeves on the mower's arms. Flip up the arms, insert the battery and turned it on. I just stood there because I couldn't hear anything, it was so quiet. But as you start to mow it makes some noise. It only makes a loudish sound during higher grass. I adjusted the deck height with it still running it's so simple. Wow! What a steal! I already had a battery from their leaf blower so total cost was $164. I spent $199 on a pair of Adidas just days before!! No more yanking on a rope, no more exhaust fumes, no more loud noise! I mowed 45 minutes with it, but by that time, I'm ready for a break anyway. I finished in less than 15 minutes after recharging the battery. Easy to assemble, easy to start, easy to handle, cuts good and close. Love it works great for my trim work and hardly hear it run!